Real Name: Shanga Fia Delph'goram. Identity/Class: Extra-terrestrial humanoid (Zhalla'Khan race). Occupation: "Imperial Star-Dancer", space traveller. Affiliations: Blue Diamond (Elton Morrow) - romantic interest and probable mate; Makkari of the Earth Eternals. 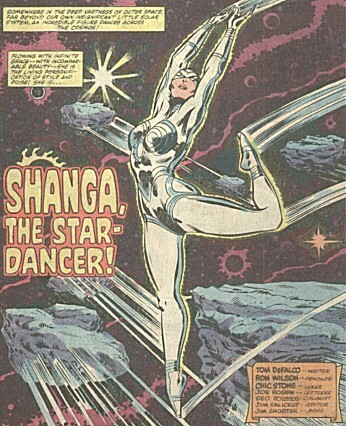 Aliases: "Silvergirl" (Makkari's nickname for her), "Star-Dancer". Base of Operations: Mobile through space; formerly a pocket dimension in Stranger's laboratory world; once stayed for a brief while (about a couple of hours) at Hartsdale, Massachusetts; formerly Zhalla'Kla (her native planet or star system). Powers/Abilities: Shanga is extremelly long-lived (millenia at the very least) if not actually immortal; she and her people are gifted with what she calls a "stellar (or cosmic) matrix-sense" - some sort of precognitive sense that may be limited to detecting "fortuitous points in (their) destinies" such as meeting potential mates. She can survive in the void of space with no special protection. 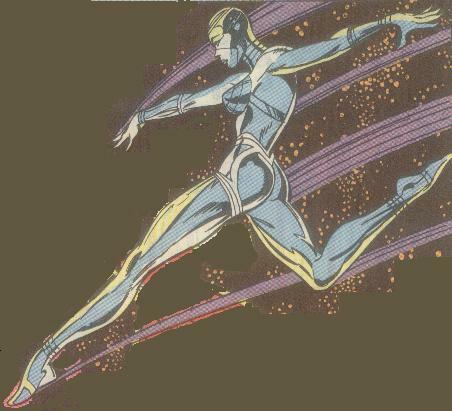 She is also capable of graceful and faster-than-light movement through interestellar space, and of various, impressive powers involving matter and energy manipulation, including at least the generation of very strong and large force fields, the projection of energy blasts from her hands, and the transmutation of living matter. Since she claims to have possession of the "power cosmic", it is possible that she indeed has access to the same Power Cosmic that the Silver Surfer and most other former heralds of Galactus employ. Somehow she also learned English real fast. Weaknesses: For all her travel capabilities, Shanga lacks significative space navigation abilities. Her impulsiveness is also notable. History: (Marvel Two-in-One#79, flashback) - Shanga is from a planet of being with powers similar to her own. Unlike most of her people she decided to develop her space dancing skills and eventually left her home planet out of sheer boredom. Failing to track her travels, she soon became completely lost on outer space. (Marvel Two-in-One#79) - Eventually Shanga sensed her likely mate on Earth and went there to find him. Arriving at the town of Hartsdale, Massachusetts she created a force field around it to avoid interference. Among those trapped inside the barrier were resident Elton Morrow, the retired Blue Diamond (a WW II hero from the Liberty Legion) and Alicia Masters, who was vacationing there with her then boyfriend, the Thing. The Thing had been out fishing when Shanga made the shield and was thus separated by Alicia, who had become a target of violence by some terrified residents who suspected her to be in league with the Star-Dancer, since her boyfriend was so monstrous (mob logic, go figure). Alicia was saved from the mob by the Blue Diamond, who had a heart attack from the strain. The Thing arrived just as Shang prepared to perform some tests on a human subject, and picked Alicia. The Thing fought Shanga, but her cosmic powers kept restoring her after each of his attacks, and she fought back against him. Finally, with Morrow's permission, the Thing used the Blue Diamond as a human missile and knocked Shanga briefly unconscious. When she recovered, Shanga analyzed the Blue Diamond and found him to be her perfect mate, but also found that his old and brittle body was quite literally falling apart before her eyes. Shanga used her powers to transmute the Blue Diamond into an even more diamond-like form, and she took him to outer space as her willing mate. (Quasar#14 - BTS) - At some point, apparently just after the pair was leaving Earth, the Stranger met them and captured Shanga. Shanga was separated from Blue Diamond and kept captive in an "enviro-zone" or "subspace" - a pocket dimension or tesseract (hypercube) that appeared much larger from the inside, but still had finite frontiers that would not let Shanga pass though. (Quasar#14) - While exploring Stranger's laboratory world, Makkari of the Eternals runs into Shanga's "subspace". He then learns some of her story and finds out that while he can leave her subspace, she is specifically blocked from leaving. (Quasar#16 - BTS) - After Overmind's defeat by Quasar, the Stranger and their allies, Shanga presumably got free and might have found Blue Diamond again. Comments: Created by Tom de Falco (writer), Ron Wilson (penciler), Chic Stone (inker). This is a rare occurrence; Marvel Two-in-One often turned out to be something of an inventory book, where characters that spent years with dangling plots met some degree of resolution. Examples include the Blue Diamond himself, Skull the Slayer, the Straw Man, the Golem, N'Kantu the Living Mummy, She-Hulk, Quasar, Giant-Man (Bill Foster), Thundra, Machine Man and Stingray. Other characters debuted or were fleshed out in MTIO to make something of a career elsewhere - that is arguably what happened to the first Spider-Woman, the Guardians of the Galaxy, the original Deathlok the Demolisher (at least insofar as his current day appearances count) and Aquarian (Wundarr). Shanga is one of very few (IMO) to debut in MTIO and reappear much later while still remaining very much marginal characters. Shanga's subspace on the Stranger's laboratory world may have had some sort of speed-dampening effect, since Makkari had to struggle for a while to accumulate enough momentum to leave it. Even allowing to the fact that he was caught by surprise into the subspace, Makkari is very fast even by Marvel Universe cosmic standards - he has been spending the last few years trying to slow down enough to return to Earth IIRC. From her powers and origin I would expect Shanga to be an alien counterpart to the Eternals, but since Makkari (who had just recognized Hyperion of the Squadron Supreme as an other-dimensional Eternal) met her and failed to recognize her as such I guess that is not the case. While researching for this profile, I found a curious site that claims, not without reason, to over-analyze MTIO#76, as well as The Marvel Two-in-One Ever-Lovin' Blue-Eyed Home Page. Both are excellent, worthy resources. Some information on this profile came from this Shanga RPG character sheet. Special thanks to SQUEAK for allowing me to use his cover image, as well for supplying corrections, a scan of the title page of MTIO#76 and additional info. He was of great help - go visit his site! While it looks like the Stranger might have captured Blue Diamond too and kept him captive in a separate environment, we have no real evidence either way. The Blue Diamond had exactly two published stories in the 1940s but made a surprising number of appearances in 1970s Marvel comics, usually along his team, the Liberty Legion. For more information please do some research on our links page. Profile by Luis Dantas with lots of help from SQUEAK and Snood. anyone else named "Diamond" or "Diamond-something"